These exercises use a progressive relaxation technique, along with Hemi-Sync® audio signals embedded by Monroe Products, to gently guide you into a deep, receptive state of relaxation. You will use this receptive state of relaxation as a “switch” to turn on your inner network of light. As a pioneer in the field of alternative medicine, Dr. C. Norman Shealy has helped medical practitioners to understand more fully the power of the mind-body connection and its relationship to maintaining wellness or restoring wellness following a trauma such as surgery or a life-threatening disease. Each of the four exercises in the collaborative Network of Light series has been voiced by Dr. Shealy. These exercises use a progressive relaxation technique, along with Hemi-Sync® audio signals embedded by Monroe Products, to gently guide you into a deep, receptive state of relaxation. You will use this receptive state of relaxation as a “switch” to turn on your inner network of light. A Guidance Manual and four exercises are included: Mind and Emotions, Endocrine System, Immune System, and Nervous System. 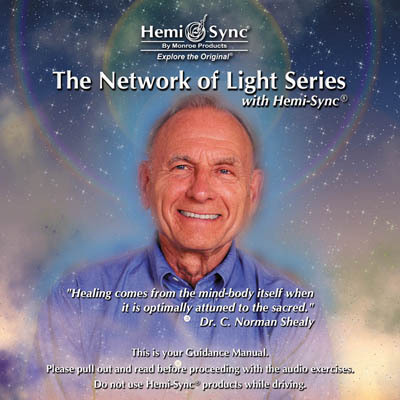 Another title by Dr. C. Norman Shealy is Hemi-Sync® Relaxation.